The word ‘motorist’ is used to describe a person who uses a car for transport. It isn’t used to describe someone who races cars professionally — that’s a driver. The word ‘driver’ is also used to describe other kinds of professional motor vehicle operators: lorry driver, taxi driver, limo driver. Equally, it’s not used to describe a bad driver. Like the Eskimoes and their (apocryphal) hundreds of words for snow, we have many ways of describing motorists who break the rules. Boy racer, amber gambler, drunk driver, road-hog, tailgater – these people are never described merely as ‘motorists’ . So the word ‘motorist’ is used to describe the large and disparate mass of people who drive a car in an acceptable way. So a cyclist is anybody who rides a bike at some point in their life? Hmm. Seems a bit broad that, especially as Linda Groomes may well also drive a car, which she was also not doing at the time of the collision, yet they didn’t call her a ‘motorist’. I assume she was wearing a coat, but she wasn’t described as a ‘coat-wearer’ either. How often must one ride a bike to be a ‘cyclist’? Once a week? Once a month? Once a year? So both Lance Armstrong and Linda Groomes were described as a ‘cyclist’ despite using their machines for very different purposes. But wait! What’s this? Plain clothes cops in Cambridge target cyclists riding through red lights or on pavements, and Hundreds fined as police launch crackdown on pavement cyclists. Also Plea to new police commissioner to tackle problem cyclists, and if you’re still not convinced, Police warning over cyclists who ride at night without lights. 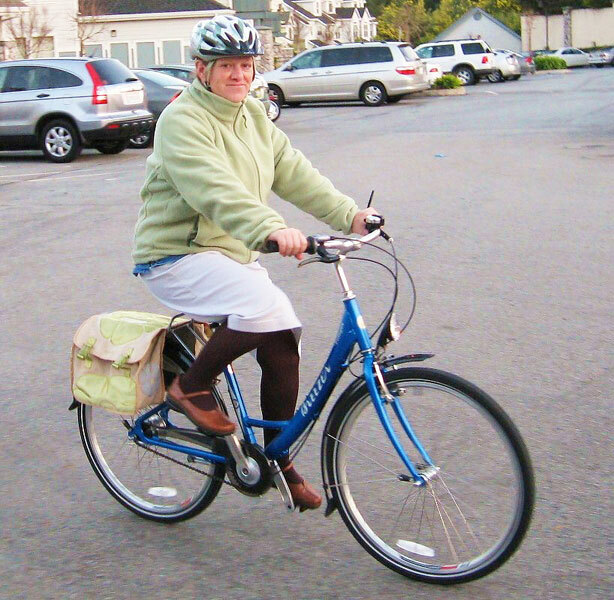 So, a ‘cyclist’ is a person who rides a bike sometimes — anyone at all, whether they’re riding it or not, whether they’re a professional sportsperson or a middle-aged grandmother or a youthful scofflaw — that is a cyclist. That’s a pretty broad brush if you ask me. What does that even mean? I was once mugged by two guys who walked up to me – am I now anti-pedestrian, even though I walk? My car was once hit by a car whose driver wasn’t looking properly. Did I become anti-motorist, even though I can drive? I was once insulted by a man. Should I become anti-man, even though I am a man? It just doesn’t make sense in any other context. Note that the headline is “bike crash victim hits out at cyclists” – at cyclists. As the word covers people who ride a bike for sport, and people who use a bike responsibly and considerately, she is surely hitting out at all of them. Even you! So the word “cyclist” is tainted beyond use, as when you use it you have no control over what the person hearing the word is thinking. They might be thinking of Uncle Frank who loves tinkering with gears in his shed, or they might be thinking of the yobs in hoodies riding aggressively along the high street. Or they might be thinking of Lance Armstrong. The definition is too loose. A photo of a cartoon in the current issue of Private Eye, Britain’s leading satire magazine, read the news months before the papers get to it, available in all good and some bad newsagents, a bargain at £1.50, why not subscribe it’s even cheaper then, please don’t take me to court! The current issue has at least one more Lance Armstrong joke, maybe two, so go buy it. I would recommend that cycling campaigners – and, indeed, US socialists – to avoid the word wherever possible. I’m just somebody who uses a bike. A bike user. I use a bike for transport. That doesn’t make me one of those cyclists! It doesn’t always work, but there is usually a way to avoid saying ‘cyclist’. I also like ‘person on a bike’ which although it’s more cumbersome than ‘cyclist’ as I don’t think it has quite the same negative connotations. Another problem with the word “cyclist” is that it is any new measures designed to improve conditions for riding a bike are said to be “for cyclists” or “to benefit cyclists”. The problem with phrases like these is that they suggest that people who aren’t ‘cyclists’ won’t benefit from any of this stuff – and that’s a hell of a lot of people who will think they are being left out. As everyone reading this blog will already know, improvements to our roads and streets will benefit children, parents, students, workers, the elderly, people with disabilities – these changes will make the country better for everyone, not just the irrationally hated, disparate minority of people collectively (and hopefully formerly) known as ‘cyclists’. I also have my doubts about ‘segregation’ and ‘segregated’ used to describe a cycle path protected from motor-vehicles. It definitely carries negative connotations in the USA – very negative, I’d be surprised if it’s used there at all – and even though the UK never had the racial segregation like the USA or South Africa did, I think there’s still some stigma attached to the word. Perhaps separation/separated and protection/protected are better, more positive-sounding alternatives? Update: In the comments, dedicated has been suggested too. I’ve heard this before, and it’s a good word which is probably better at getting the speedy commuters on board than ‘separated’. In the USA they also use ‘buffered’ to refer to a specific type of cycle lane which has a painted buffer between the bikes and the cars. Also, while it lasts, check out this bit about the Lance Armstrong scandal on Charlie Brooker’s Weekly Wipe – “the news asked anybody on or near a bicycle about it“, because everybody who rides a bike is into sports cycling, right? After publishing this article, I was looking at my stats and saw a link from a similar article on a cycling website in New Zealand — it turns out someone down under was having the same thoughts as me, albeit a couple of weeks earlier! I had never given it a thought until I read your blog post, but in fact in Dutch we have different words for a cyclist on a race bike (‘wielrenner’ which roughly translates to ‘wheel runner’) and a cyclist in everyday traffic (‘fietser’). And a mother who drives her child to school in a cargo bike, thereby slowing down other cyclists (as seen in upper/middle class urban areas), is called a ‘bakfietsmoeder’. I’d read that the Dutch had more than one word for it! Makes sense, really. So the photo that Adam linked to (below) http://instagram.com/p/T6CLW0Mt8V/ a Dutch speaker would describe as “een fietser en een wielrenner” whereas an English speaker would say “two cyclists”. Funnily enough, I used Google Translate to convert “een fietser en een wielrenner” into English, and it comes out as “a cyclist and a cyclist”! Loved this article! As I was reading it I chuckled and my friend said “why you laughing?” I said: “It’s a cyclist joke” and he said “bloody cyclists” – exactly! Campaigners should take note of the negative connotations of cyclist. I suppose “separated” bike lanes is the same problem? There is a reality that one must use a different term when working with municipal engineering depts. on cycling infrastructure. Such lanes have a physical barrier that prevents cars from driving immediately into the lane and endangering a cyclist. I guess cyclists are people transporting themselves or others or goods using human powered vehicles. 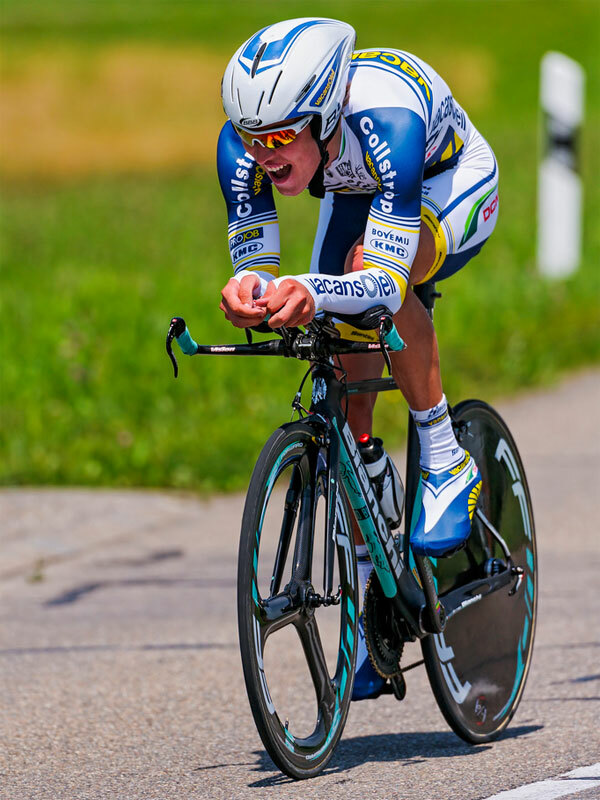 Whether you are a mother towing kids in a trailer, children carting camping gear in paniers, racing cyclists training, executives commuting to work on bikes or a person towing 200kg of sugar cane in Java you are effectively a cyclist. I don’t see a problem with the word cyclist. But there may be a general confusion, possible created by the media, that cyclists are enthusiasts rather than just another person getting from A to B on a bike or HPV. Is it just a human perception issue? Also, yes, of course (more precise?) ‘separated’ or (more moms’-support-winning?) ‘protected’ are the preferable terms to frame the infrastructure issue. Tough one. Certainly, we should be “designing for cycling” and not “designing for cyclists” and I like separated or protected rather than segregated. But cyclist? I was in my orange top yesterday, blasting (if an average of 15mph is blasting) along the wild-east that is the A118. I guess to many I was a cyclist or looney, but the conditions dictate the behaviour, right? I think the biggest challenge is we want to reach a different market, I will cycle whatever, so perhaps we need to talk more about “people who want to use cycles/bikes”, it is difficult and Brooker’s item perceptively showed how the media is to blame. The media is certainly a big part of the reason why ‘cyclist’ has come to mean anybody near a bike, usually doing something bad. Which is why cycle campaigners should make sure never to use the word ‘cyclist’ as it can so easily be taken out of context. If they don’t use it, then the media won’t quote them saying it. It’s just spin, I guess. Politicians know all about it, and so should cycle campaigners. Promoting something as “a boon for the whole community” sounds much better than “improvements for cyclists” for example. Your last question should be the easiest. Why not ‘dedicated’ bike lanes, or, if that sounds too elitist, ‘committed’ bike lanes- oops- i’m not a native speaker so I may just have jailed all cyclists. It sounds a bit clumsy to go speaking of ‘bike riders’ instead of cyclists. Of course you must have known for a long time about the distinctions made in Dutch between bike racers and other people riding a bike, e.g. wielrenners and fietsers. But perhaps English is more static than a minority language such as Dutch, which is quick to adapt foreign words and makes texts of 200 years old hard to read. Otherwise there would be hopes of new terms catching on quickly. Perhaps you need four or five new words, like bikalism for harrassment by youth cycling on pavements, speediclists for fast racers etc??? Ah, ‘dedicated’ – I’d forgotten that one! I’ll add it to the list. I like the idea of coining a new phrase for yobs on bikes. How about “yikes”? “Bike rider” won’t do. Phil Ligget uses it all the time when delivering his commentaries on Tour de France and the like. The Americans appear to use the word “bicyclist” in much the same way as we seem to use Cyclist – as in “The League of American Bicyclists” which I take to be the US equivalent of either CTC or British Cycling. Given that we are two nations divided by a common language, perhaps we could co-opt the word bicyclist and attribute to it a different meaning, as a way of defining ourselves in less cumbersome terms than “bicycle user” or “citizen cyclist”. Actually, I quite like the word fietser. After all, the English language has for centuries developed by absorbing foreign words, like verandah or pyjama from India, schadenfreude or zeitgeist from Germany, crepe from France, folio from Italy. Why not one more? It is snappy, does what it says on the tin, and like any newly coined word we would soon forget that hasn’t always been there. And I look forward, more in hope than expectation, to the day when we can sneer at bakfietsmoeders instead of Volvo 4×4-driving “yummy mummies”. I often wonder if cyclists and Christians are the only groups left in the UK where it’s OK to be non-PC. Certainly if one was to replace cyclist or Christian with “gay”, “black” or “Muslim” you would be blocked by most of the moderators on pretty much every newspaper site – including the Daily Mail! It’s interesting that we are identified by our machines rather than the means of controlling them “car DRIVER”, “airplane PILOT”, “horse RIDER” and so on. I should be a bike RIDER – specifically a push-bike rider as I ride my bike – but it is a bit of a mouthful. I like the idea of fietser but let’s face it, it’s a foreign word and reeks of the EU and we all know what the Daily Mail readership will make of that! I would argue that sexuality and ethnicity are different to transport and religion in that one can choose whether to ride a bike or believe in a god, whereas everyone is born with their skin colour and sexual orientation. 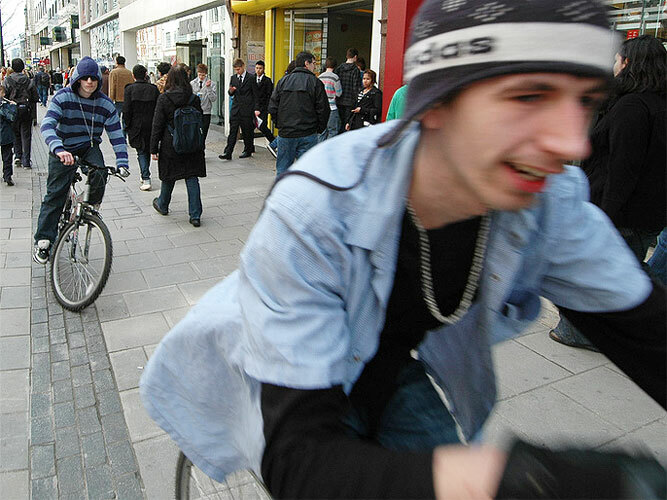 There seems to be some belief that riding a bike turns people into criminals somehow. In addition to “buffered,” many of us Americans seem to be leaning toward “cycletrack.” That doesn’t bother me one bit. We’re generally not too keen on European terminology. While the term “cyclist” is reasonably understood, it is not colloquially as popular as “biker.” “Cyclist” is more often a self-ascription used by dedicated cyclists. I think “biker” irks me even more than “cyclist,” and I also use dissociative language when explaining my transportation choices. In formal writing, “bicyclists” is perhaps more common than “cyclists” in order to provide clarity. “Bicyclist” is rarely used colloquially. I like how the USA does it, actually – ‘buffered’ meaning painted buffer, ‘protected’ meaning some sort of physical barrier. In the UK I’ve found that people refer to any kind of bike infrastructure as a “cycle lane” as that’s all we’ve had for so long the common lexicon has little else. I quite like cycle track, or cycle path. Here ‘biker’ refers to someone who is into motorbikes (I think in Australia “cyclist” can refer to motorbike users too). I think I like “bike user” because it doesn’t imply anything about the person other than that they use a bike, and it’s clearly understandable. “Bike-rider”, for me, does roll smoothly of my tongue, and I’ve no doubt, other people’s tongues as well. The only issue I see with the term is that it may be more awkward as a written word. Given English’s often awkward orthography (spelling & pronunciation to you mere mortals *sniffie-pie* –with nose haughtily in air) “bikerider” may be awkward to read, hence my employment of a dash between its root words. “Bike-rider” won’t do. Phil Ligget uses it all the time when delivering his commentaries on Tour de France and the like. Now ain’t that an awesome photo!! Ha! That’s a great photo! Sums it all up, really. I think the problem many cyclists suffer from is “we’re a minority so we must be victimised” syndrome. If tyou drive a car or ride a bike like a twonk you should be fined. Simples. Well yeah, of course traffic law violations should be punished, regardless of vehicle type. Great article SC. I like to ride my bicycle, that’s all. But in seriousness, it’s a really interest point. As @TheRantyHighwayman says above, if the media were to talk about ‘infrastructure to enable people to cycle’ rather than ‘infrastructure for cyclists’, it becomes so much more inclusive. It’s a real big deal in how the message is inferred. It’s the difference in asking for funds for a minority group and asking for everybody. Shame we don’t have control but it seems most ‘bike riders’ agree. Perhaps we can start something. “Don’t call me cyclist” campaign. And lastly, great point about the “ist”. Although I was thinking of far worse words than specialist. I could certainly live with “bicyclist” to describe transport cyclers. I’m trying to promote the word ‘motorism’ to denote prejudice , hatred or discrimination. It fist appeared on the web as ‘Institutional motorism’, in terms of urban planning decisions. It’s now in Merriam-Webster as ‘addiction to or practice of motoring’. Of course, by back-construction, the word ‘motorist’ could become as pejorative as ‘sexist’ or ‘racist’. Now, how about ‘Cyclism’ ? Has anyone noticed the odd use of the singular ‘cyclist’ where grammar would demand the plural ‘cyclists’ ? Or grammar would demand the indefinite article – ‘a cyclist’ ? – “Helmet saved my life, says cyclist” above. It seems to be an implicit statement that ‘all cyclists are one’ – a prototype, if you like ! “It’s a cyclist joke” above. Once you notice it, it seems very common on internet forums. We get it: you hate sport cycling, whatever its road cycling or mountain biking. Let people ride what they want to ride, not what YOU want them to ride because of your romanticism for slow heavy Dutch bikes that are impossible to traverse hills without getting off and pushing. Did you read the article, or just the title?! Coincidentally, motoring campaigners often do not like being described as ‘motorists’ because they fear it makes them sound like monomaniac obsessives defined by their weird fetish rather than just perfectly ordinary common-or-garden addicts. 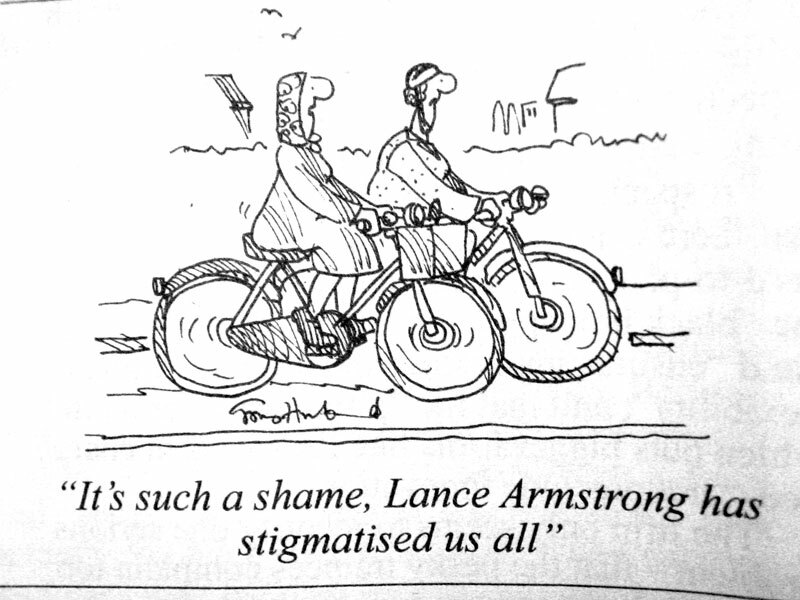 Presumably touchy because they were/ are major promulgators of negative connotations to ‘cyclist’?